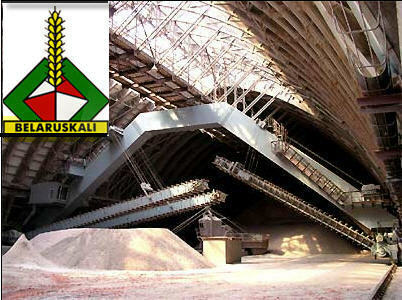 Cash-strapped ex-Soviet republic Belarus is negotiating the sale of its most prized asset, the potash producer Belaruskali, under the terms of a $3bn bail-out loan agreed this month with Russia, the Wall Street Journal reported on Tuesday. Responsible for one-third of the worlds potash fertiliser production, Belaruskali could be worth as much as $20bn. A frontrunner for a takeover is Russia's top producer Uralkali owned by billionaire Suleiman Kerimov. The combined group would easily push Canada's Potash Corp. from the top producer spot. President Alexander Lukashenko had resisted the sales but a 36 percent currency devaluation last month and a massive state hard currency shortage has forced the veteran leader to reach out for foreign help. The country's gold and hard currency reserves shrank 28.6 percent since the start of the year to reach $3.59 billion on June 1, with only $1.32 billion of that held in cash, the state statistic agency reported on Tuesday. Image of Belaruskali surface facilities courtesy of the company. The company, with headquarters in the city of Soligorsk south of the capital Minsk, operates four mines and refinery complexes and employs about 20,000 people. Commercial mining operations commenced in 1961.